Photo credit: The Local Italy. Rome was brought to a standstill as buses clogged up Piazza Venezia. 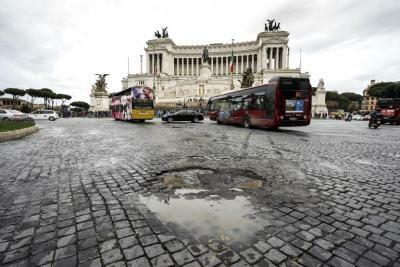 ROME - Frustrated coach drivers, enraged by Raggi’s proposal to ban tourist coaches from the city centre, decided to fight back Thursday by parking their buses for eight hours in Piazza Venezia. Despite criticisms from authorities and residents, protestors are reportedly only warming up. “The demonstration continues, tomorrow we will protest in Piazza Montecitorio,” one driver insisted furiously. “Stop the protest because you are paralysing the city,” Raggi ordered. The Mayor unveiled the controversial proposal after a meeting with an Operators Delegation recently. It not only includes a provision banning tourist-coach operators from the city centre, but also increases the cost of authorised entries. “We occupied Piazza Venezia in a peaceful way. Claims that we blocked the piazza are false, Atac buses were capable of passing easily,” claimed an association representative who was involved in the protest. Some drivers have organised a sit-in in Piazza del Campidoglio, while others have set fire to Five Star Movement flags. “We want to speak with Raggi, because it is useless speaking to councilors Meleo and Stefao, who have refused to listen to ideas that we believe would improve tourist coach trips."